Chelsea Manning/InstagramChelsea Manning was released from prison in May. Chelsea Manning, who came out as transgender a day after being sentenced to jail for leaking hundreds of thousands of classified military documents to WikiLeaks, called Trump’s announcement “cowardice” on Twitter. He then went on to explain the decision by saying that the military could not be “burdened with the tremendous medical costs and disruption” that transgender people would allegedly bring. Conservatives have frequently argued that healthcare like hormone therapy and gender reassignment surgery are too costly to provide to active service members. Manning, who went through her own protracted legal battles to receive hormone drugs while in prison, called out Trump’s statement in tweets of her own. “This has been studied extensively, and the consensus is clear: There are no cost or military readiness drawbacks associated with allowing trans people to fight for their country,” said Joshua Block, an ACLU senior staff attorney who represented transgender clients in the past. Manning was released from prison in May. During the seven years she was locked up, Manning was seen as a hero by some and as a traitor by others. 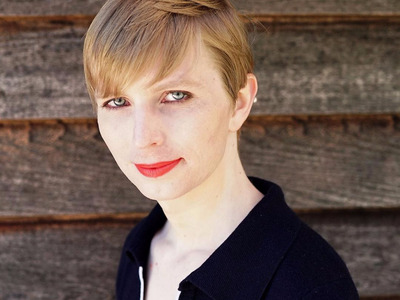 Born as Bradley Manning, she elevated discussion on LGBT rights in the military after her struggles with gender identity came to light in the midst of the WikiLeaks scandal.